In Part 1 and Part 2, I have highlighted some tips and tricks to get a website menu more user-friendly and attractive to website visitors. In this part, I will reveal some useful user interface features that will help you become a more efficient Menu Generator user. You can now easily import HTML code with menu links into Menu Generator. To import menu structure, just click on the Import button and paste the code into the input field. A classic menu structure is a series of nested <ul> elements; a single link is a combination of the <li> and <a> elements. Menu Generator is now based on new, significantly improved core. As a result, the system works much faster, especially with the menus, which have a large number of elements. Now you can set the desired menu name from the Options, Design Window or My Menus page. Color contrast is very important for better readability. For a light-colored or transparent menu, you can set the dark background. You can now insert HTML code in tooltips. For example, you can use images, formatted text, any other HTML element as information about the menu element is being hovered over. Menu Generator now remembers its state (active Tabs, expanded option groups, IDE settings, etc. ), even if a user closes the browser. In Part 1, I have highlighted some tips and tricks to get a website menu more user-friendly. In this part, I will continue talking about other useful tips and tricks to get a website menu even more attractive to website visitors. The dm.HideItem(MenuName, ElementID); method hides the selected element. The dm.ShowItem(MenuName, ElementID); method shows the hidden, selected element. 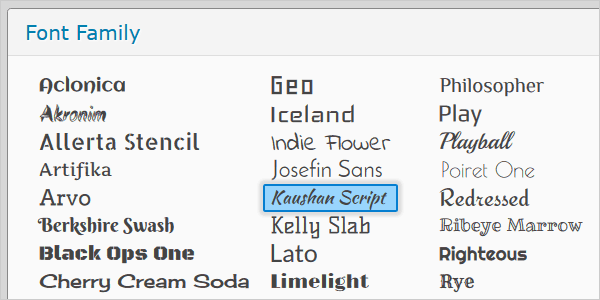 Menu Generator offers 10+ standard fonts and 50+ of the most popular web fonts. Interface enhancements to better serve you. Several minor bugs are fixed. In this short post, I’m going to show how to use Menu Generator more effectively. The main goal is to make a website menu most user-friendly. Our free video tutorials will quickly guide you through everything you need to know about Menu Generator. The Right float property specifies that the element will float on the right side. Uncheck the Hoverable checkbox (on the "Element Properties" tab) if the Link Element or Image Element must not be highlighted when a user moves the mouse over it. 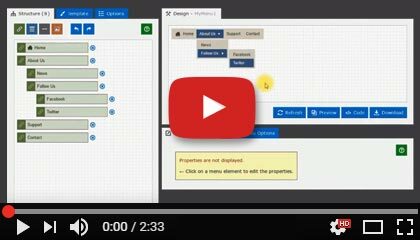 The new design of Structure Editor to better serve you. Universal Embed Code; it can be used for both "HTTP" and "HTTPS" URLs. Enhanced the site performance by better data compression. Fixed the bug with "&" symbol in the Responsive menu. Fixed the bug with Arial Black font in Mozilla Firefox browser. Fixed the bug with an incorrect width of the vertical menu. The padding property allows you to specify how much space should appear between the content of an element and its border. You can set different padding values (horizontal or vertical) for the main menu and submenus. Menu Generator now includes the collection of 123 most popular icons. Added new icons: Phone, Smartphone, Instagram, Headphones, Share, Hashtag, and More. Menu Generator introduces the new Starter Plan which is a "light" version of the main Basic Plan. Starter plan is suitable for customers who need a single menu for a small website. It includes all the main features such as multiple levels of hierarchy in the structure, full access to Template Library, customizable arrow indicators, etc., and allows you to create a professional menu for your website. Learn more about plans and pricing here. Now Embed Code includes a hash value as a unique identifier which forces the browser to display the latest version of your menu. You can now use different events to open/close submenus. Mouse event to show - specifies a value indicating whether the submenus are opened by mouse click or automatically when the user moves the mouse pointer over the menu element. Mouse event to hide - specifies a value indicating whether all of the opened submenus are closed by mouse click outside the menu or automatically when the mouse goes away. Fade effect - specifies whether the menu displays the submenus with animated Fade effect. Image Element - now you can change the image without deleting the element. Live Demos - you can now load the live demos in Menu Generator for editing. Added support for images in menu elements. Menu now consists of the four types of elements: Links, Headers, Separators, and Images. Image Element is similar to the Link Element. It includes a raster image, text (label) and link (URL) to the web page or document. People process visual information faster. Adding images to the menu provides visitors with visual clues about the site content and adds a nice design touch to your site. This example shows the menu which is based on Image Elements. The "DIY Projects" submenu is split into columns (including Header Elements). 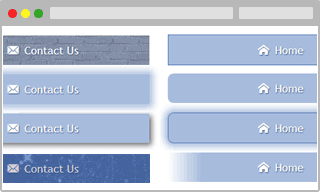 Today, a simple CSS menu is the most common tool for website navigation. Unfortunately, in many cases, a CSS menu does not meet all requirements of usability. 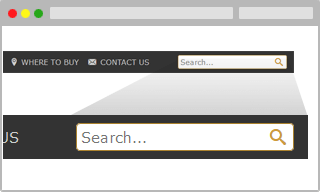 The Visibility property allows hiding an element without deleting it. Hidden elements are displayed in the structure tree as semi-transparent. Menu now uses a special mechanism for image preloading. Preloading is a technique where the image is downloaded to the cache before it's needed. That way when the image is really needed it can be retrieved from the cache and displayed immediately. Thus, a background image of the hovered element (or submenu background image) appears now immediately and without "empty squares". 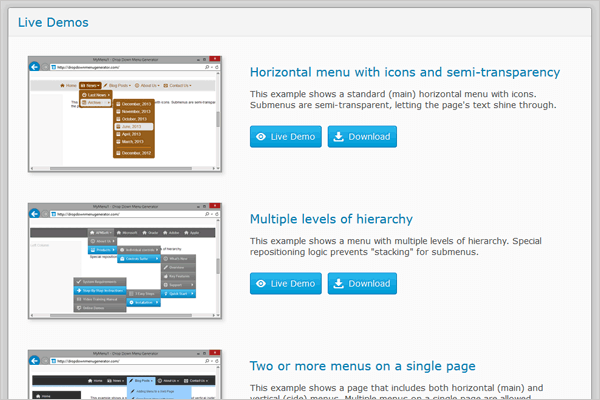 Now only one style (Web Font, Icon Set) is used for multiple menus placed on the page. This significantly improves performance of the page with multiple menus. Menu now consists of the three types of elements: Links, Headers, and Separators. Link is a basic menu element. It can include an icon, text (label) and link (URL) to the web page or document. The browser is directed to the URL when a user clicks the Link Element. Header is a useful element which allows organizing the menu elements into groups. Separator is a simple element which represents a thematic break between the groups of elements. Drop-down menu (submenu) can now include a division of various categories in a single panel. This new feature gives an effective solution to displaying a lot of content while keeping a clean layout. 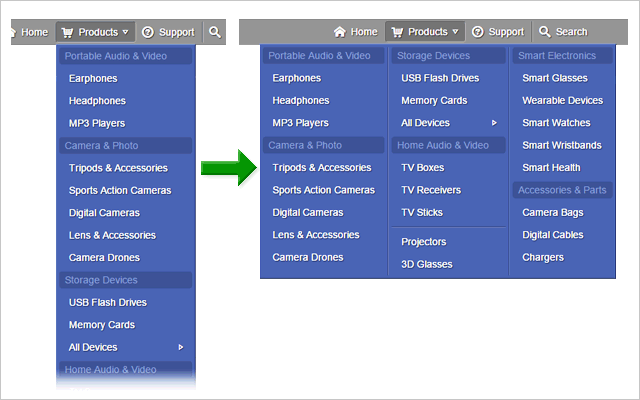 The "Products" submenu is split into three columns. Elements are arranged into groups (with headers). The "All Devices" element has also a submenu. 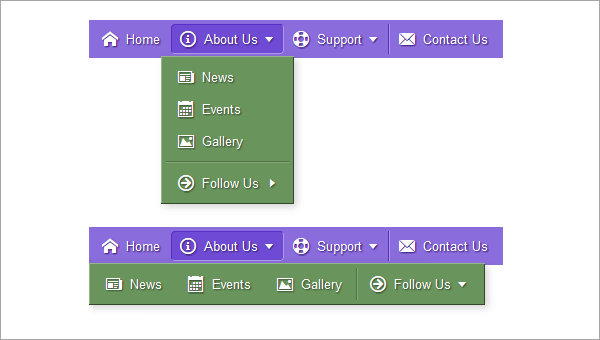 The submenu includes a vertical line between each column to make the layout more visually appealing. Our Referral Program is simple. For each person you refer who makes a purchase (for the first time or renewal), you will get 3 free months to your subscription. Also, when someone uses your link to sign up, they get 20% off for the first order. Find your own unique referral link on the Account Settings page and share it on Facebook, Twitter, Pinterest or your blog - wherever your friends can see it. 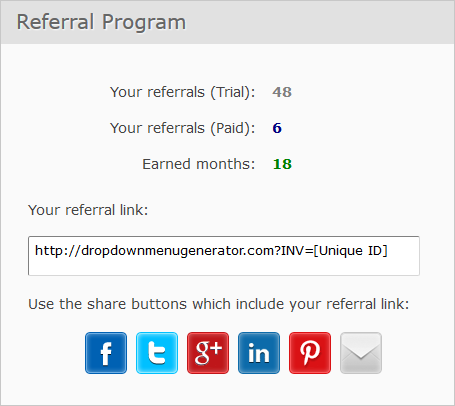 Or, use the direct share buttons which include your referral link. Menu Generator includes the fixed collection of 100+ most popular icons. Now you can import your own icon sets and use them for the menus in Menu Generator. There is no need to repeat that the most effective way to make site navigation a truly user-friendly is to add icons. This blog post describes how to add custom icons to your Drop-Down Menus. This symbol is an abbreviation for the home directory of the website. Thus, the link will be considered as "http://www.MySite.com/MyPage.htm". left - aligns the left edge of the submenu with the left edge of its parent. center - sets the center position relative to the parent item. 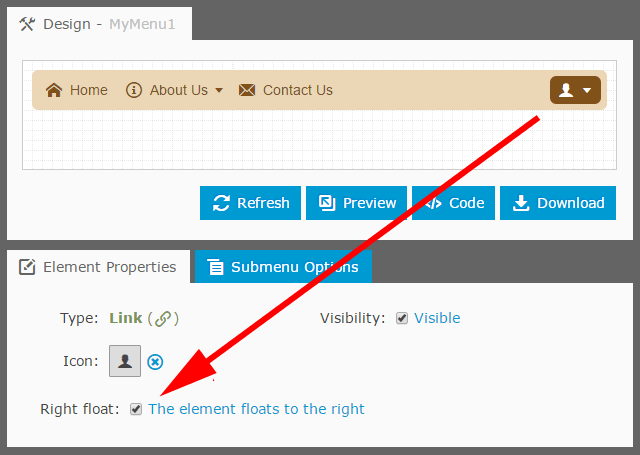 right - aligns the right edge of the submenu with the right edge of its parent. length - specifies integer value of the left margin in pixels with a range from -9999 to +9999. Added support for empty arrow indicators. If you do not want to show arrow indicators in your menus, use empty arrows. The following video gives a quick overview of features and functionality. 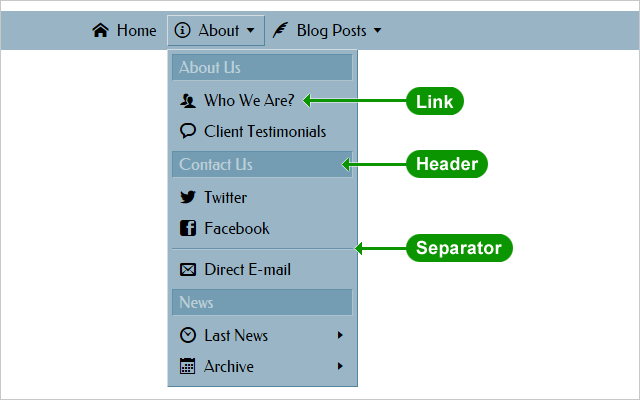 In my previous blog post, I described how to add Drop Down Menu in Blogger. That post describes the basics for creating a menu and adding it to the desktop version of your blog. This post expands on this scenario by adding your existing menu to the mobile version of your blog. Homestead SiteBuilder is a very popular, easy-to-use website building tool, which allows you to quickly create an entire website for business or hobby. 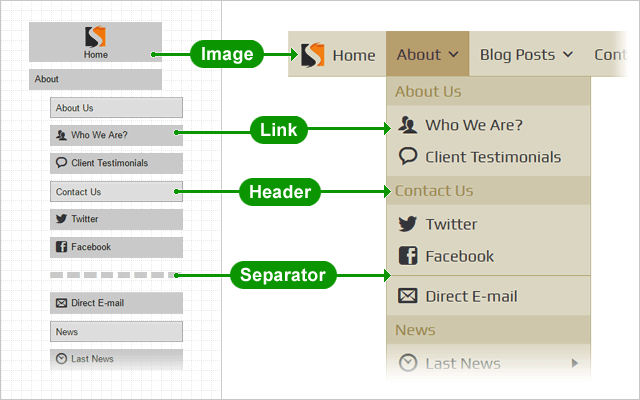 SiteBuilder includes hundreds of design templates to choose from. You can insert photos, videos, e-commerce capabilities and much more. Unfortunately, SiteBuilder has no such useful component for website navigation, as a drop-down menu. We are sorry, but the free version forces us to focus on volume and less on features. In our plans to add more features to Menu Generator. If you have the Free account, you can continue using it for free. Menu Generator now includes new options for Responsive Menu. How does it work? If the viewport width is less than the width of the menu bar, an alternate compact menu appears. Make your menu responsive just by enabling the "Responsive Menu" option. If the menu includes a large number of items, enable the "Expandable Nodes" option to save screen space. 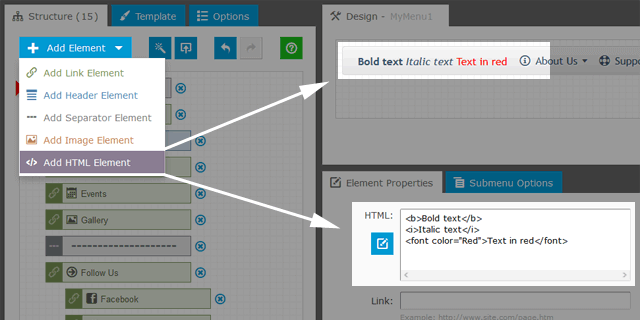 To see the responsive menu in action, open the Live Demo. Menu Generator now includes the collection of 116 most popular icons. Added new icons: Tumblr, Flickr, sport, weather, Oscars Award, and cancel2. 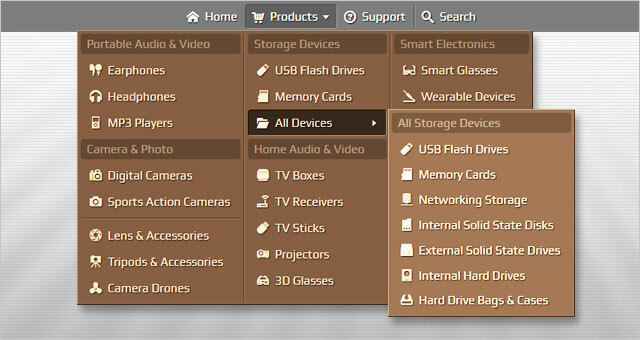 The collection displays the icons grouped by categories. The main horizontal menu is now optimized for single-icon items. The icons are now displayed with center alignment. Improved menu performance in Internet Explorer. Added support for web fonts. Now the collection offers 11 standard fonts, and 51 of the most popular web fonts. Use of non-standard fonts will give your menu the attractive look that matches the theme of your site. Embed Code is now compatible with a website which runs on SSL ("https") protocol. Menu Generator now does not use images for arrow indicators. They are represented with Unicode symbols and displayed as a plain text. This significantly improves performance of your menu. Menu Generator now includes the collection of 105 most popular icons. You can use the general icons (Home, Help, E-mail, etc. ), icons for social networking (Facebook, Twitter, etc. ), currency symbols, multi-purpose icons (arrows, dots, etc.) and others. Menu Generator has been moved to the new server for better performance, reliability, and uptime. For Priority Technical Support you can now use direct e-mail address. Available for Paid plans only. Fixed the bug in Menu Generator when you edit two or more menus at the same time. The size of the menu's script has been reduced. As a result, the menu works with better performance results. Fixed the bug with "&" symbol in the menu links. Now your menu is hosted on our server and you can use Embed Code to display it directly on your web pages. So, you do not need to download the menu and then upload it to your website; any modification made to the menu in Menu Generator will be immediately reflected in the menu on your web pages. Now the menu can be displayed with a fixed position. A fixed position menu is positioned relative to the viewport, or the browser window itself. The viewport doesn't change when the window is scrolled, so a fixed positioned menu will stay right where it is when the page is scrolled. This Live Demo shows the menu displayed with a fixed position. It means that if you scroll down, the menu will remain in the viewport - so you can quickly access the navigation no matter where you are on the page. The Live Demos Page includes a few menu examples such as a standard drop-down menu with icons and semi-transparency, the menu with scrollable submenus, the menu in fixed position (Sticky Menu), and others. The new FAQ section is intended to provide an easy and quick way to find answers to most frequently asked questions. Additional options help to get the desired menu appearance. 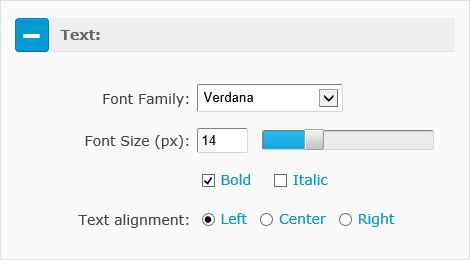 You can now choose the Font Family, Font Size, Text Alignment, and make the text Bold and Italic. Now you can highlight the current menu item (make it active) by using the additional code. The highlighted item indicates which page the user is currently viewing. The code highlights the selected item as well as all the parent items (the whole navigation path). CSS (Cascading Style Sheets) is used to style page elements. As a result, the appearance of the menu may differ from the selected template because the page's CSS may style the menu as well. Now Menu ignores most of the page CSS rules and displayed with the required appearance, according to the chosen template. A help icon (a blue circle with a question mark) is added to key places in Menu Generator. 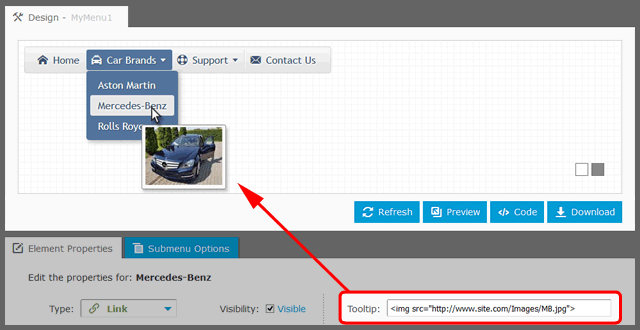 When a user clicks the help icon, a "pop-up" window with context help will appear providing hints or tips. 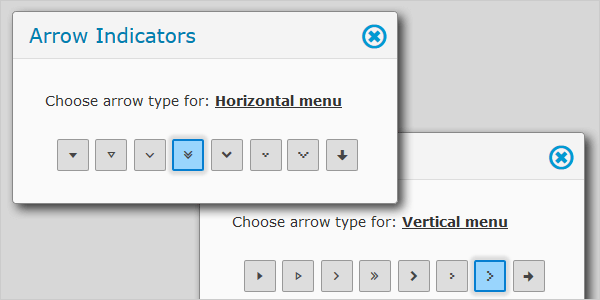 Menu Generator now includes the "Submenus Height" property under the Additional Options tab. 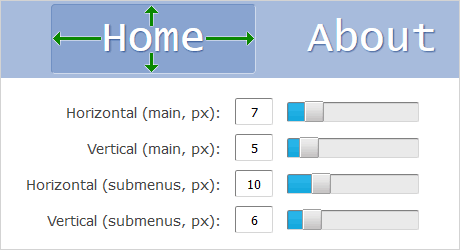 The property specifies the maximum height in pixels for submenus. A submenu automatically becomes scrollable if its height less than the real height of its contents. Now Menu Generator works even faster as it compacts the data before sending it from the browser to the server. A menu created by the Menu Generator is a single folder with a few files. To put the menu on the page, you upload the menu folder to the web server where your site is hosted, and paste a small code into the page to show up your menu. But what to do if you use a free hosting or publishing platform (such as Blogger or Tumblr) which does not allow uploading custom folders to the site/blog? Fortunately, Google Drive can be used as an awesome FREE hosting for your menu. Google Drive is a reliable storage with unlimited bandwidth, very fast speed and 100% uptime. You can store your menu on Google Drive, but display it on any website or blog by a direct link to the menu hosted on Google Drive. Tumblr is a very popular publishing platform, which includes more than 180 million blogs. Unfortunately, almost all of them do not have a drop-down menu as a highly convenient way to navigate to posts or pages. It is because the themes in Tumblr do not include an option for adding drop-down menus. It is important that your website is compatible with mobile and tablet devices so that the user experience is just as good as the desktop version. Without mobile compatibility, your website will be missing out on huge amounts of potential traffic. The menu created in Menu Generator is now compatible with iOS (iPhone, iPad and iPod Touch) and Android devices. No programming or design skills are necessary to create a professional menu with Drop Down Menu Generator. The Generator does everything automatically, quickly, easily and gives out the professional drop-down menu for any web site. 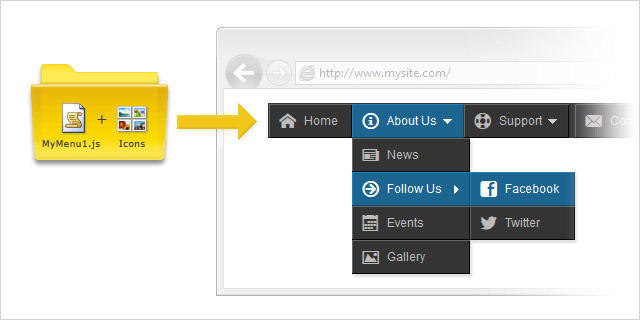 In this short post, we will describe in detail how to add the menu to a web page. Now the menu is compatible with Search Engines. Menu Generator produces an additional code with menu links. It allows the search engines to index all the pages referenced by the menu links. Menu Generator now includes the collection of 100+ most popular icons. You can use the general icons (Home, Help, E-mail, etc. ), icons for social networking (Facebook, Twitter, etc. ), multi-purpose icons (arrows, dots, etc.) and others. During the customization of your menu, you may change the font size of items. The size of each icon is set automatically and depends on the font size. Now the scaling of the icons is noticeably improved. Icons are very important to the user-interface. The most effective way to make site navigation a truly user-friendly is to add icons to the menu. Icons greatly improve the communication between the visitors and the menu on any website. Menu with icons stands out from the crowd and looks a lot better than the other ones. The presence of icons proves the quality of the website, makes a great impression on visitors and increases the site traffic. The new feature allows you to create the clone of an existing Menu. It generates the copy, including the structure, template, and all of the menu settings. Improvements for better performance results. Now the Menu Generator compresses the data before sending it to the browser. Website design is enhanced too. No unnecessary images, texts, useless page elements. Now you can add an icon to any menu item just by one mouse click. Icons are very important to the user-interface. 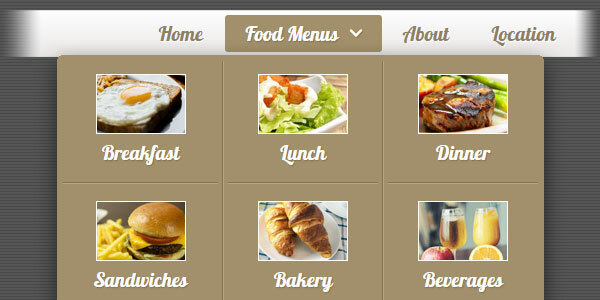 Icons will greatly improve the communication between the visitors and the menu on your website. Menu Generator includes the collection of 90+ most popular icons. The size and color of each icon are defined automatically depending on the text of the menu item. Yahoo SiteBuilder is a very popular tool, which allows you to quickly create an entire website without any knowledge of HTML. It includes hundreds of customizable templates for business and hobby uses. 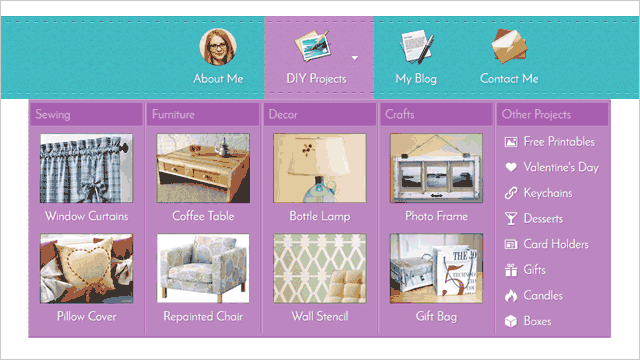 With just a few clicks, you can insert photos, create new buttons, add wallpapers, draw tables, create forms and much more. Unfortunately, SiteBuilder has no such useful component for website navigation, as a drop-down menu. The use of a drop-down menu is a highly convenient way to navigate. Unfortunately, most blogs at blogger.com do not have this handy feature. The main problem is that blogger.com does not include the Gadget for drop-down menus and most bloggers do not have the programming skills to work with HTML, CSS, etc. Now you can adjust the width and alignment for your menu. The width can be defined in pixels or in percent of the containing block. An alignment has three values: Left, Center, and Right. Now, the menu is displayed properly on web pages, which have an incorrect markup. The menu will ignore a non-valid, a non-well formed or even an illegal HTML/CSS code. Menu Generator introduces new paid plans and options for our customers. As before, the Free Plan includes all the main features such as multiple levels of hierarchy in structure, full access to templates library, customizable arrow indicators, etc., and allows you to create a professional menu for your website. Upgrading to a paid plan allows you to get more benefits from our service. Now you are not limited to only one menu in your account. Depending on the plan you have chosen, you can have up to 128 different menus in your account. This feature is very useful if you develop/support multiple web sites or if your site includes separate areas for navigation: main menu, side menus, bottom menu, etc. Now you can add/remove menu elements easily by using the context menu in the Structure Editor. An item or a separator can be directly inserted into the proper place in your structure by one click. No more tedious dragging the element through the structure tree. Now you can use a personal name for each menu. 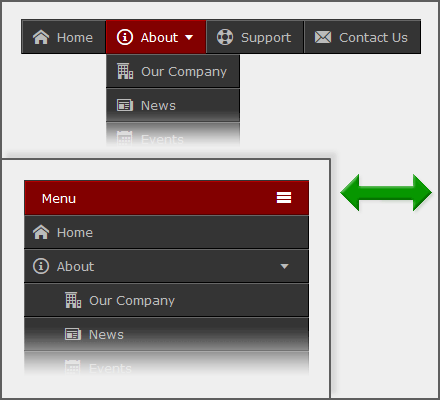 It allows you to place multiple menus on the same page for better navigation: main menu, side menus, bottom menu, etc. No more conflicts between menu instances! Now you can store your menu in Google Drive and display it on your website, blog, guestbook, photo album, forum, etc. Google Drive can be now used as a hosting with direct link for your menu. The Structure Tab now displays the total number of menu elements. Inactive tabs have a compact look with three dots. A separator in the structure tree now reflects the selected state. The message "Menu saved!" is displayed each time when the menu is saved in the database. Standard messages are replaced with a nice-looking modal popup window. Code improvements for better performance results. Menu Generator now includes the collection of arrows. You can choose the arrow type and the brightness separately for horizontal menu, vertical menu, and submenus. The color of arrow is defined by the color of item's text (separately for normal and hover states). Now a tooltip has a fixed set of colors (grayscale). This was made in order to avoid showing unreadable colors in tooltips after the color customization for entire menu. Menu Generator now includes expandable sections of settings. This cleans up the website design and enables the user to choose what he wants to see. The optional Tooltip field is now located below the main fields: Text, Link, and Target. Fixed the bug where the Zip archive was broken if the menu structure has a large number of elements. New website design to better serve you! The new design not only looks good, but is also more functional. Site performance is enhanced. No unnecessary images, texts, useless page elements. Follow us on Twitter and Facebook to keep up to date with all of our latest news and events! 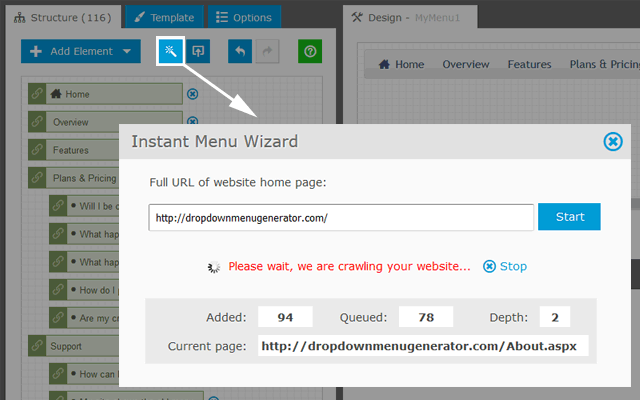 We will inform you about new features, templates, and examples of our Drop Down Menu Generator. Also, you will be informed about all the new blog posts. The arrow indicates that the menu item holds its own submenu. Now, the color of arrows corresponds to the color of menu items for both states: normal and hover. Now you can set the font color separately for the main menu and submenus. Each color has two states - Normal and Hover. By default, the menu has a background color, gradient or texture, depending on which template is chosen. Usually, the website already has some background color or texture. In order to avoid discrepancies between the website and the menu, you can now turn off the menu background. Some of the templates use fonts with shadow effect. Now, the color of shadow corresponds to the color of menu.